While I did for a better state prepare." The parenthesis in these lines was so maliciously represented, that the good bishop was made to believe from it, that Pomfret prefered a mistress to a wife though no such meaning can be deduced, unless it be asserted, that an unmarried clergyman cannot live without a mistress. But the bishop was soon convinced, that this representation was nothing more than the effect of malice, as Pomfret at that time was actually married. The opposition, however, which his slanderers had given him, was not without effect for, being obliged on this occasion to stay in London longer than he intended, he caught the small-pox, and died of it, in 1703, aged thirty-five. 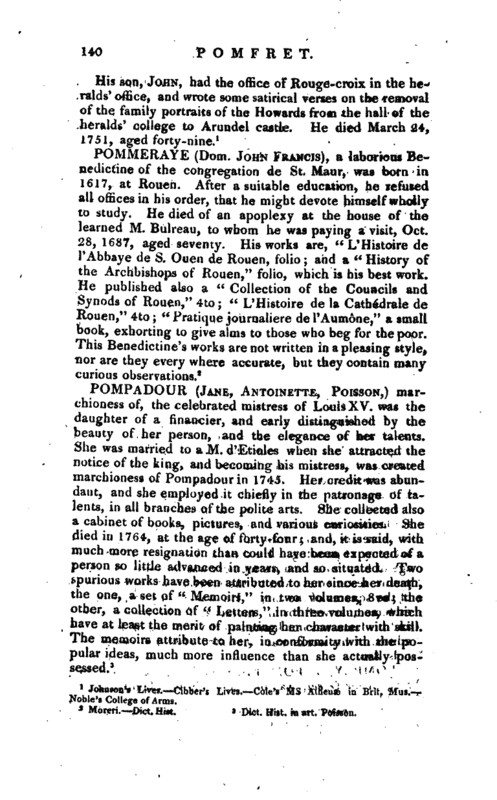 A volume of his poems was published by himself in 1699, with a very modest and sensible preface. Two pieces of his were published after his death by a friend under the name of Philalethes one called “Reason,” and written in 1700, when the disputes about the Trinity ran high; the other, “Dies Novissima,” or, “The Last Epiphany,” a Pindaric ode. His versification is sometimes not unmusical; but there is not the force in his writings which is 'necessary to constitute a poet. 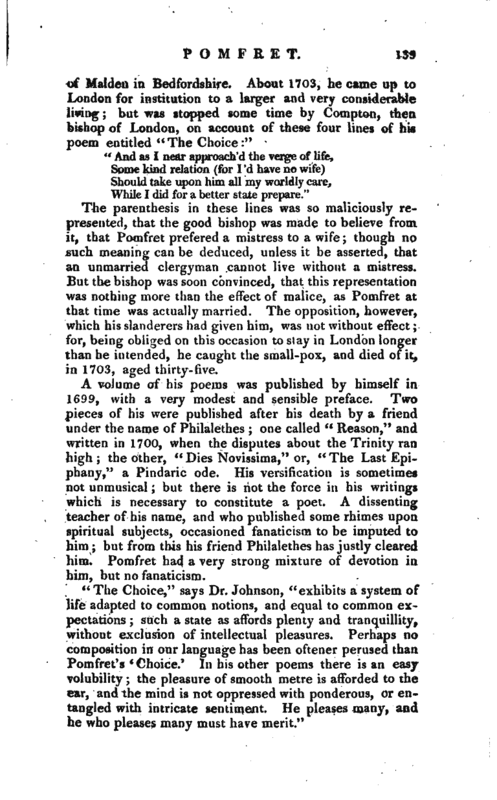 A dissenting teacher of his name, and who published some rhimes upon spiritual subjects, occasioned fanaticism to be imputed to him; but from this his friend Philalethes has justly cleared him. 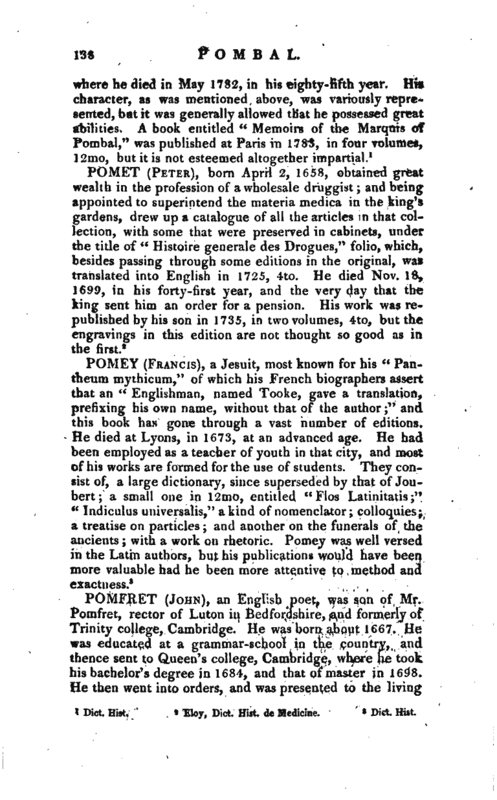 Pomfret had a very strong mixture of devotion in him, but no fanaticism. Johnson’s Lives. Gibber’s Lives. Cole’s ms Athens in Brit. Mus.­Noble’s College of Arms.